It doesn't get any better than this! This is a bona fide must-have acquisition for any veritable Star Wars aficionado. It will become the centerpiece of your collection. Taken from the exhilarating escape scene in Star Wars: A New Hope, this astounding Millennium Falcon resin statue is perfectly cast down to the very finest detail. The entire piece measures an incredible 17 1/2-inches tall x 26 1/2-inches wide x 68-inches long! 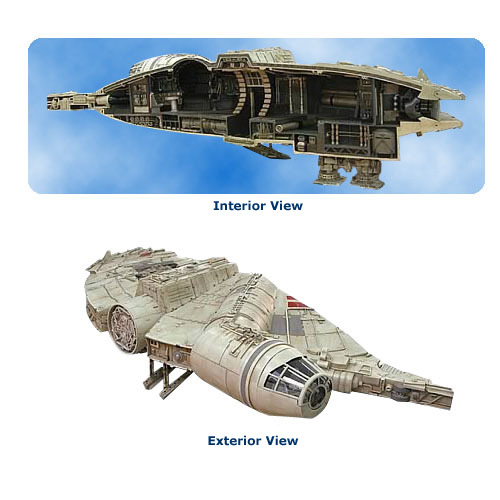 Truly a unique collector's item, one half of the Millennium Falcon is displayed while the other half provides an amazing open view of the inside of the vessel. Don't let this one get away! Limited edition of 400 pieces. Character statues shown in the images are sold separately and not included.